Recreational boating is an incredibly attractive pastime – who wouldn’t be attracted to time spent out on the water with family and friends? Unfortunately, those who have never experienced the reality of owning a boat are more susceptible to being lured into taking a boat that’s offered for free or buying one on the cheap, and the results aren’t always good. 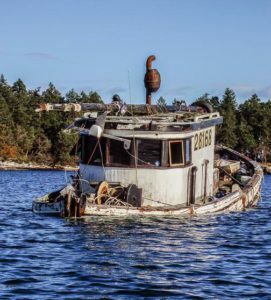 Boaters know what I mean when I say that owning a boat is never cheap – in time or money – and the one in my yard in need of some serious TLC is a testament to that! Unfortunately, if boat upkeep and the associated costs are not borne by the boat owner, the burden is frequently passed along to the community and the environment when that vessel reaches a problem state. It is only a matter of time before trouble comes along, as untended vessels will certainly end up adrift, washed ashore, or possibly even sunk. Unmaintained boats release fuel and other toxins into the marine environment, putting marine life and habitat at risk, not to mention the danger they pose to mariners and beachgoers and the damage they can cause to shoreline facilities. The biggest challenge we have in mitigating the impacts of problem vessels is the jurisdictional quagmire that surrounds them. You’ll know what I mean should you ever want to contact the proper authorities to notify them of an incident – there’s a good chance you will be bounced around to various agencies such as the Coast Guard, Transport Canada, the Provincial Emergency Program, the Receiver of Wrecks, the BC Ministry of Forests, Lands, and Natural Resource Operations, the local government, or perhaps even the police. In fact there is such confusion surrounding the issue that BC’s Ministry of Forests, Lands, and Natural Resource Operations has recently published a very useful 12-page guide, Dealing with Problem Vessels and Structures in BC Waters. Clean Marine BC is Georgia Strait Alliance’s green boating and marina eco-certification program, and has distributed tens of thousands of our Guide to Green Boating. A clean, well maintained boat is a greener and safer boat, thereby reducing our environmental impacts, as well as helping to ensure that our experience is more enjoyable. MP for Nanaimo-Cowichan, Jean Crowder, is proposing legislation designating the Coast Guard as a receiver of wreck and requiring them to take reasonable steps to contact the owner and also to provide for government to make regulations on the removal, disposition or destruction of derelict vessels. The intention is to give the Coast Guard the regulatory power it needs to take action before a derelict vessel becomes a problem. Bill C-638 is a step in the right direction in dealing with the jurisdictional quagmire surrounding derelict vessels. Please support this bill by writing the Minister of Transportation, Lisa Raitt (lisa.raitt@parl.gc.ca), and by contacting your MP. For more information on Bill C-638, visit http://openparliament.ca/bills/41-2/C-638/ and http://jeancrowder.ndp.ca/derelict-vessels. It is up to boaters like us to prevent our pastime from becoming someone else’s headache. Let’s keep our boats afloat…Down at the Dock!